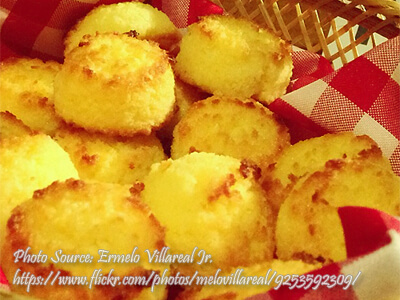 These baked goodies are made from desiccated coconut, condensed milk, eggs, flour and sugar. This is a Filipino version of macaroons where it is shaped like tiny cup cakes instead of the usual small round or circular shaped cakes with different colors. They are crisp and golden on the outside and moist and chewy in the inside. Line macaroons tin cups with colored fluted paper cups. Set aside. Cream butter and sugar in a bowl until light and fluffy. Pour eggs and mix well. Add in flour, baking powder, desiccated coconut, condensed milk and vanilla. Blend thoroughly. Place mixture to prepared macaroon cups and bake in 375 °F preheated oven for about 15-20 minutes until golden brown.